The Western plains were passed over and left unsettled until the advent of the railroads, which began to cross the plains coinciding with the arrival of the great cattle herds which came up from the South, after a market. This market did not wait for the completion of the railroads, but met the railroads more than half way; indeed, followed them quite across the plains. The frontier sheriff now came upon the Western stage as he had never done before. The bad man also sprang into sudden popular recognition, the more so because he was now accessible to view and within reach of the tourist and tenderfoot investigator. These were palmy days for the Wild West. Unless it be a placer camp in the mountains, there is no harder collection of human beings to be found than that which gathers in tents and shanties at a temporary railroad terminus of the frontier. Yet, such were all the capitals of civilization in the earliest days. One town was like another. The history of Wichita, Newton and Fort Dodge, Kansas was the history of Abilene, Ellsworth and Hays City, Kansas and all the towns at the head of the advancing rails. The bad men and women of one moved on to the next, just as they did in the stampedes of placer days. To recount the history of one after another of these wild towns would be endless and wearisome. But, this history has one peculiar feature not yet noted in our investigations. All these cowtowns meant to be real towns some day. They meant to take the social compact. There came to each of these camps men bent upon making homes, and these men began to establish a law and order spirit and to set up a government. Indeed, the regular system of American government was there as soon as the railroad was there, and this law was strong on its legislative and executive sides. The frontier sheriff or town marshal was there, the man for the place, as bold and hardy as the bold and hardy men he was to meet and subdue, as skilled with weapons, as willing to die; and upheld, moreover, with that sense of duty and of moral courage which is granted even to the most courageous of men when he feels that he has the sentiment of the majority of good people at his back. To describe the life of one Western town marshal, himself the best and most picturesque of them all, is to cover all this field sufficiently. 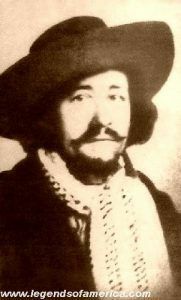 There is but one man who can thus be chosen, and that is Wild Bill Hickok, better known for a generation as “Wild Bill,” and properly accorded an honorable place in American history. 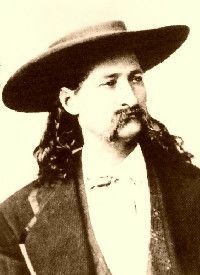 The real name of Wild Bill was James Butler Hickok, and he was born in May , 1837, in La Salle County, Illinois. This brought his youth into the days of Western exploration and conquest, and the boy read of Kit Carson and John Fremont, then popular idols, with the result that he proposed a life of adventure for himself. He was eighteen years of age when he first saw the West as a fighting man under James H. Lane, of Free Soil fame, in the guerrilla days of Kansas before the Civil War. He made his mark, and was elected a constable in that dangerous country before he was twenty years of age. He was then a tall, “gangling” youth, six feet one in height, with yellow hair and blue eyes. He later developed into as splendid looking a man as ever trod on leather, muscular and agile as he was powerful and enduring. His features were clean-cut and expressive, his carriage erect and dignified, and no one ever looked less the conventional part of the bad man assigned in popular imagination. He was not a quarrelsome man, although a dangerous one, and his voice was low and even, showing a nervous system like that of Daniel Boone—”not agitated.” It might have been supposed that he would be a natural master of weapons, and such was the case. The use of rifle and revolver was born in him, and perhaps no man of the frontier ever surpassed him in quick and accurate use of the heavy six-shooter. The religion of the frontier was not to miss, and rarely ever did he shoot except he knew that he would not miss. The tale of his killings in single combat is the longest authentically assigned to any man in American history. 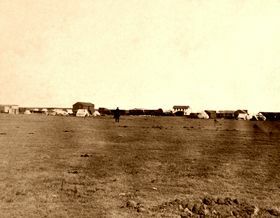 After many experiences with the pro-slavery folk from the border, Bill, or “Shanghai Bill,” as he was then known—a nickname which clung for years—went stage driving for the Overland Stage, and incidentally did some effective Indian fighting for his employers, finally, in the year 1861, settling down as station agent for the Overland Stage at Rock Creek Station, Nebraska, about fifty miles from Topeka, Kansas. He was really there as guard for the horse band, for all that region was full of horse thieves and cutthroats, and robberies and killings were common enough. It was here that occurred his greatest fight, the greatest fight of one man against odds at close range that is mentioned in any history of any part of the world. There was never a battle like it known, nor is the West apt again to produce one matching it. The borderland of Kansas was at that time, as may be remembered, ground debated by the anti-slavery and pro-slavery factions, who still waged bitter war against one another, killing, burning, and pillaging without mercy. The Civil War was then raging, and Confederates from Missouri were frequent visitors in eastern Kansas under one pretext or another, of which horse lifting was the one most common, it being held legitimate to prey upon the enemy as opportunity offered. Two border outlaws by the name of the McCanles boys led a gang of hard men in enterprises of this nature, and these intended to run off the stage company’s horses when they found they could not seduce Bill to join their number. He told them to come and take the horses if they could; and on the afternoon of December 16, 1861, ten of them, led by the McCanles brothers, rode up to his dugout to do so. Bill was alone, his stableman being away hunting. He retreated to the dark interior of his dugout and got ready his weapons, a rifle, two six-shooters, and a knife. The assailants proceeded to batter in the door with a log, and as it fell in, Jim McCanles, who must have been a brave man to undertake so foolhardy a thing against a man already known as a killer, sprang in at the opening. He, of course, was killed at once. This exhausted the rifle, and Bill picked up the six-shooters from the table and in three quick shots killed three more of the gang as they rushed in at the door. Four men were dead in less than that many seconds; but there were still six others left, all inside the dugout now, and all firing at him at a range of three feet. It was almost a miracle that, under such surroundings, the man was not killed.